 Alaska is BIG, so we will start with some wide shots, made by pasting several photos together. Toward the right you can see a glacier in the Kenai Fjords region near Seward. The next photo shows the port of Seward (and part of the Alaska pipeline). 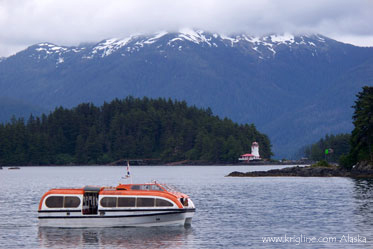 The two photos above are actually left and right of a huge panorama; Ketchikan was the first stop of our cruise. Click here to see the whole panorama. 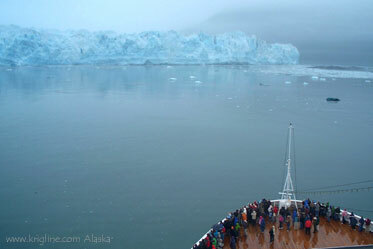 When the cruise was over, we boarded a small boat to look for wildlife and glaciers in the Kenai Fjords near Seward. 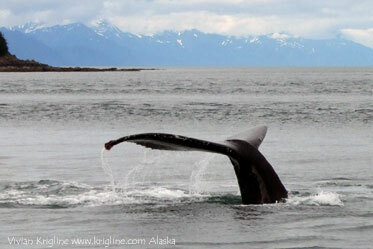 This trip, and the whale-seeing trip near Juneau, were really worth the extra money! The animals are spectacular, and it was remarkable to be this close to a glacier. I've inset the boat photo (the size of the red box; also at the bottom of page 1) to show just how big a "river of ice" is! This composite is made from four photos. 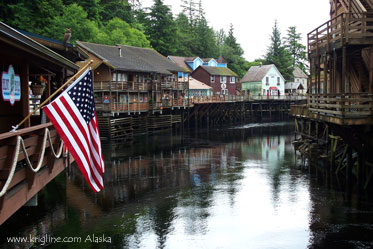 The oldest part of Ketchikan was built over this river because there wasn't any land available. 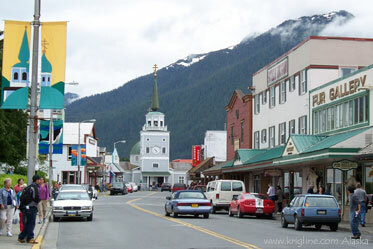 Although Ketchikan is the state's third biggest city, it only has about 14,000 people! That is the size of a neighborhood in China! It was very foggy when our cruise ship visited the Hubbard Glacier in Glacier National Park, but Photoshop has removed some of the haze. It was freezing to stand outside taking pictures! Sitka was the capital when Russia owned this territory, and the Russian church is still a vital part of Alaskan life (especially among the native Americans). It was fascinating to learn about Russian pioneers who translated the Bible into "Eskimo" languages. This shows the "lifeboats" (i.e., launches) we rode from the ship to Sitka's dock. We really enjoyed visiting this town, which has several historic attractions, a totem pole exhibit, a wildlife "hospital," nature walks, a port-side church that serves visitors free tea, and much more to offer. 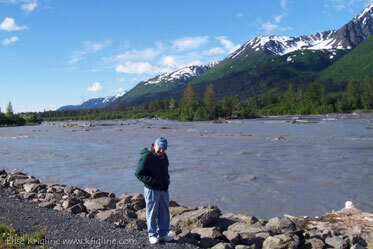 Dad is standing by a river just across the road from our motel near Seward. We enjoyed many sunny days, though it was often quite cold (even in July). 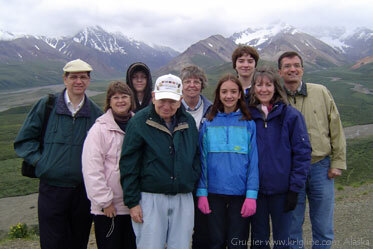 Private cars are not allowed in most of Denali National Park, so we took a bus to enjoy the sights together. It was too cloudy to see Mt McKinley (also called Denali), the highest mountain in North America. For animal photos, click over to page 2. Michael's Dad took these beautiful lighthouse photos from the cruise ship. 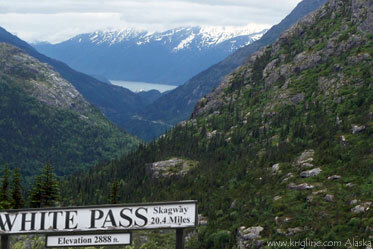 That little white dot in the distant water [above left] is a cruise ship, docked at Skagway. 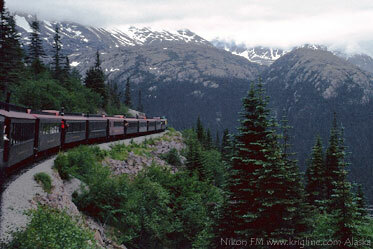 From there we took a train 20 miles up to White Pass (elevation 2888 ft) on the Canadian border. This railroad (and especially the "V" bridge shown below) was an engineering marvel at the end of the 19th century, when it was built to transport miners seeking their fortune in Alaska's Gold Rush. In addition to the beautiful scenery, you could see part of the rugged and dangerous trail carved into the mountain by hundreds of men and mules while the train was being constructed. 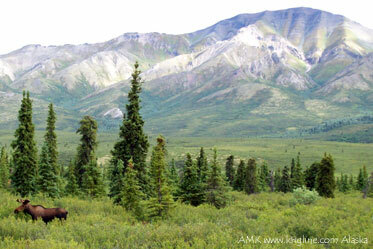 A moose grazes in the foothills near the entrance of Denali National Park. We also saw bears, a bobcat, caribou, elk, a fox, wolves, mountain sheep, rabbits, various birds, and lots of eagles. For more animal photos, click over to page 2.